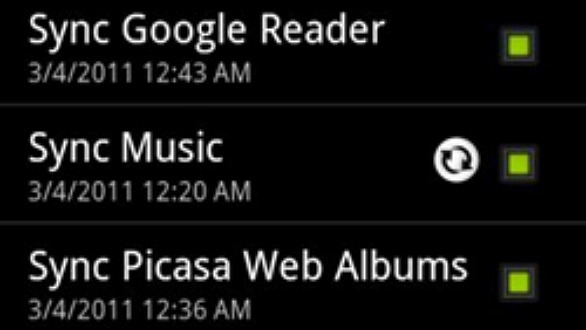 Hidden Music Sync Feature Discovered In Android; Google Music Store? Looks like Google is planning to conquer the online music scenario now. If you think this is an overstatement then think again! A developer has found solid proof to what can be called as Google's Music Sync service which in turn might be a part of a Google Music Store. We have already told you about Google Music Store, earlier. All this started when a developer ripped the music application from the Motorola Xoom Android tablet and then installed it on to his Android smartphone. To his surprise, he found a new setting called "Sync Music" as you can see in the screenshot above. Now the thing is this "Sync Music" setting thing actually synced all his music! Apparently, the developer uploaded all the music on his phone's memory card to somewhere on Google's servers, then replaced that memory card with a blank one and was able to pull all the files back down to his phone. Others were able to replicate the same features as well. This ripped Music app from the XOOM tablet shows the "Sync Music" option only when it is installed on some other device but the "Sync Music" feature does not show up on the XOOM tablet in the first place! Google has already been launching it's Online Music service to various countries. Last time we talked about Google Music was when the service was launched in India.